One tablet of Iodoral supplies an amount of total elemental iodine, comparable to the average daily intake of this essential element by mainland Japanese, a population with a very low prevalence of fibrocystic disease of the breast and breast cancer. Several studies have demonstrated a relationship between low iodine intake and fibrocystic disease of the breast (FDB), both in women and laboratory animals. The minimum amount of iodine required for control and prevention of FDB is equivalent to 0.1mg multiplied by kg body weight/day. For example, for a 50 kg woman, the daily amount of iodine would be 5 mg. The thyroid gland needs iodide to function properly. The original study done 80 years ago to control goiter in adolescent girls used 9 mg iodide daily. During the early 1900's, the iodine/iodide solution called Lugol solution was used extensively, effectively and safely in medical practice, for both low activity and above normal activity of the thyroid gland. The recommended daily intake for iodine supplementation was 2 to 6 drops of Lugol solution containing 12.5 to 37.5 mg total iodide. That amount was mentioned as lately as 1995 in a book on Pharmaceutical Sciences. Several investigators have shown convincing evidence connecting inadequate iodine intake and breast cancer. Japanese women living in Japan consumed a daily average of 13.8 mg total elemental iodine and they experience one of the lowest prevalence (risk) for breast, ovarian and uterine cancer. In the 1960's, one slice of bread in the USA contained the full RDA of 0.15 mg iodine. The risk for breast cancer was then 1 in 20. Over the last 2 decades, iodine was replaced by bromine in the bread making process. Bromine blocks thyroid function and may interfere with the anticancer effect of iodine on the breast. Now, the risk for breast cancer is 1 in 8 and increasing 1% per year. The RDA limits for vitamins and minerals were established after World War II. One of the last essential elements included in the RDA system was iodine, established in 1980 and confirmed in 1989. The RDA for iodine was based on the amount of iodine/iodide needed to prevent goiter, extreme stupidity and hypothyroidism. The optimal requirement of the whole human body for iodine has never been studied. Therefore, the optimal amount of this element for physical and mental wellbeing is unknown. Based on demographic studies, the mainland Japanese consumed an average of 13.8 mg daily and they are one of the healthiest people on planet earth. Lugol solution is a time-tested preparation with a proven track record for over 150 years. Two drops contain 12.5 mg iodine/iodide, an amount very close to the 13.8 mg average intake of mainland Japanese. Administration of iodine/iodide in liquid solution is not very accurate, may stain clothing, has an unpleasant taste and causes gastric irritation. 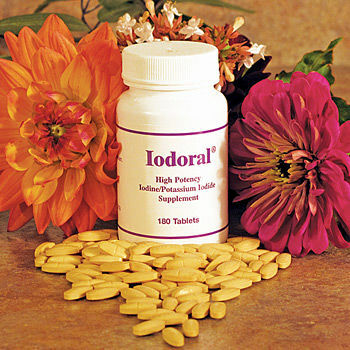 Iodoral® is a precisely quantified tablet form containing 5 mg iodine and 7.5 mg iodide as the potassium salt. To prevent gastric irritation, the iodine/iodide preparation was absorbed unto a colloidal silica excipient; and to eliminate the unpleasant taste of iodine, the tablets were coated with a thin film of pharmaceutical glaze.